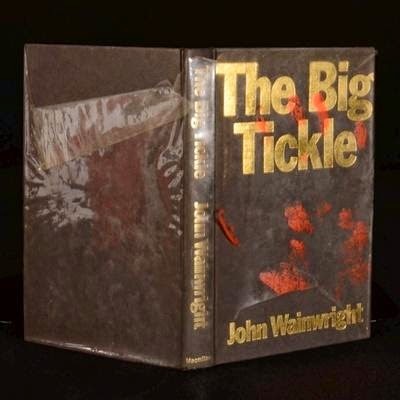 As I mentioned earlier, I read four novels by British writer John Wainwright to be mentioned in my forth-coming book on British crime paperbackers. I've been at it for over ten years and I thought it would finally come out next Summer, but we'll have to see about that, as I still have loads of work to do. But now John Wainwright has finally been done with. Wainwright is best known - if known at all today - for his police procedurals. He wrote some dozens of them saying he got his inspiration from Ed McBain and his 87th Precinct series and that clearly shows. The settings are realistic and Wainwright shows some critical insight into the society he writes about. There are lots of characters, all colourful. The police are a mixed bunch, some of them are almost crooks themselves, taking law into their own hands, some of them just look on from the side and realize there's no use getting mixed with their colleagues' doings. The actual crooks are very much crooks: sleazy low-life scum. This is one of the weakest things in Wainwright's police novels. He shows real contempt when he writes about the lower class people and their inhabitats. In Wainwright's novels there's also lots of dialogue. One can imagine being in a police station amidst all the nervous talk and shouting. I read The Big Tickle (1969; Kurja päivä kuolla in Finnish) and Talent for Murder (1967; Huhtikuun murhat in Finnish) and liked the latter more, even though the former is more clearly set in the reality of the streets. The novel suffers from bad Finnish translation though. Wainwright also wrote some middle-class tragedies. I read two of them, The Distaff Factor (1982; Tuomion jälkeen in Finnish) and Cul-de-sac (1984; Umpikuja in Finnish). Georges Simenon spoke highly of the latter, and it is indeed the better of the two in its depiction of a sad marriage that ends in the death of the wife. It's already declared an accident, when an eye-witness comes forward saying it was a murder, done by the woman's husband. Cul-de-sac is a dense book with a pleasing climax. I hope I'm not giving anything away saying Wainwright uses the same technique that made Gillian Flynn famous with her Gone Girl. The Distaff Factor starts with a promising idea: the husband of a middle-class woman is declared guilty of maiming and killing three prostitutes. This one also has a twist in the middle and yet another in the end, but I wasn't entirely satisfied. The book drags somewhat in the middle and the end climax is both misogynistic and somewhat implausible. Yet it also shows Wainwright could really write tragedy. Wainwright wasn't a paperbacker in his native land, but his books came out in paperback here in Finland, that's why I'm including him in my book. Some weeks (or months?) ago I wrote a review of John Grant's A Comprehensive Encyclopedia of Film Noir and listed some Finnish specimens of film noir. I mentioned I'd be seeing some of them on big screen, since there was a festival of Finnish cinema here in Turku where I live and one of the themes of the festival was - ta-ta! - Finnish film noir. Here's a lowdown of the films I managed to see. Varsovan laulu (The Warsaw Song, 1953, director: Matti Kassila): hardboiled and cynical tale of two booze smugglers, who struggle with love and lust. Very noirish with a downbeat ending and some quite seedy love triangle in the middle of the film. Chris Paischeff makes a very nice femme fatale in the lead. Suffers from the director's indecisiveness: there are two plotlines that don't mix easily. Suffers also from laughably props in the scenes set overseas. Pikajuna pohjoiseen (Express to North, 1947, director: Roland af Hällström): I'm not sure whether this really qualifies as a film noir, but it has a very downbeat ending. The film seams almost effortlessly into a tragedy after being a thriller with comic overtones. Possibly one of the best Finnish feature films ever, reminiscent of English thrillers of the thirties and especially French films of the thirties and fourties. Set almost entirely on a train. Suffers from overacting at various points. Silmät hämärässä (Eyes in the Mist, 1952, director: Veikko Itkonen): a very peculiar film about a writer who's down on his luck and drifts into a hotel room seeing four desperate-looking men in a room across the street. The writer imagines what has brought the men together. Their fictional story is told in a flashback (that has some flashbacks seamed in it), and in the end it's revealed the men's story forms the writer's new short story. Quite intricate with some good scenes throughout, but a bit contrived and not very plausible, but still possibly the most noir of the Finnish film noirs. Yhden yön hinta (The Price for One Night, 1952, director: Edvin Laine): an attempt to bring the neorealistic formula of the films such as The Naked City to Finland. Succeeds at times, but is also unintentionally funny, especially in the scenes with criminals. On the other hand, Joel Rinne as the criminal mastermind gets into a Dennis Hopper craze as he twists his lady friend's head violently back and shouts: "Kiss Me! Kiss Me!" The film is fast-moving, though, and never really boring. Olemme kaikki syyllisiä (We Are All Guilty, 1954, director: Aarne Tarkas): director-writer Aarne Tarkas was very interested in American film and film noir (and in American popular culture altogether, he picked his last name from ERB's Mars books!) and that shows in his comedies and crime films. This is a serious attempt to depict a doomed love story between a young man who suffers from mania and fits of rage and an innocent young woman who loves him first, but betrays him in the end. Quite believable and suspenseful to the end. I believe Tarkas himself suffered from ADHD that was left unattended, and I got to thinking this film might be something of a self portrait. Kultainen kynttilänjalka (The Golden Candelabra, 1946, director: Edvin Laine): crime film with gothic and comedy overtones. Never seen it, so can't comment. From what I've heard veers into camp. 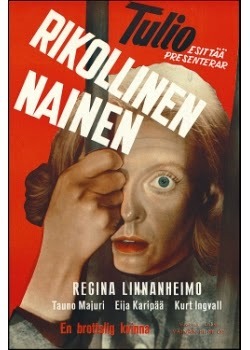 Rikollinen nainen (The Criminal Woman, 1952, director: Teuvo Tulio): I've seen this earlier, a story of a woman who's driven mad by a jealous and abusive husband. I've written about Tulio earlier here. These are of course not all the film noirs made in the Finnish studio system, I'm sure there's at least a dozen more. And of course there are some fringe examples, crime films that have lots of comic element in them, spy films made in the appropriate era, psychological thrillers that are devoid of the noir feel, pessimistic domestic dramas with downbeat endings etc. I'm sure some of the films I mentioned above could be shown at a noir festival like, say, Noir City that has had British and Spanish film noirs during the past years. Paging Eddie Muller! See also my posts on Finnish western films, part one here and part two here. And since this probably qualifies as an Overlooked Film post, go to Todd Mason's blog here to check the other overlooked films out! Rapture, The Sniper, John Wainwright et al. I've also been reading - amidst the Finnish war stuff and some Tolkien (work-related both) - police and other crime novels by British John Wainwright, whose books are quite good, despite Wainwright's tendency to overwrite his rants about the slums and the people therein. Will get back to them later on.